Currently, about a dozen government and commercial Earth imaging satellites circle the Earth daily. They take thousands of pictures that governments, private companies, and non-governmental organizations (NGOs) use for purposes as varied as monitoring wheat production, looking for point sources of pollution, and displaying images on Google Earth. Long before the launch of the first Earth imaging satellites, some envisioned using them to help prevent wars and atrocities by detecting, proving, and publicizing acts of military aggression and large-scale violations of human rights. Now that these imaging capabilities are well established and the quantity and quality of the available satellite imagery is steadily increasing, we are better able to understand its benefits and limitations for these purposes. cheap generic viagra Satellites cover vast swaths of the Earth’s surface every day, but not all of it. Additionally, searching the huge amounts of imagery that they collect for evidence of preparations for attacks is an overwhelming task even for large intelligence agencies, let alone for NGOs. Therefore, a critical component of any Earth observation mission is tasking the satellites—that is, instructing them to maintain or vary their orbit, and where to point their cameras along their path. This requires some knowledge of where to look. visit website UNOSAT (the U.N. Operational Satellite Applications Program within U.N. Institute for Training and Research, or UNITAR) maintains a hotline staffed around the clock by duty officers. Launched thirteen years ago to make the benefits of satellite remote sensing and GIS available to its sister U.N. agencies, U.N. member states, and their citizens, UNOSAT works exclusively in response to requests, usually from U.N. agencies. “We have been working on internal conflicts where there’s a humanitarian aspect,” says Einar Bjorgo, the agency’s manager, who points out that it has not yet worked on detecting military build-ups and preparations for trans-border attacks. buy now “Typically, we first get a request from a humanitarian actor to understand what the internal situation is like, because in these situations there is little or no access to the field for security reasons. So that is exactly where satellite imagery can come in and play a very important role: to be the eyes of the U.N. and the international community as to what goes on during conflicts. Often, either during or after the event, we are requested to do specific assessments related to potential human rights violations. We provide our objective, neutral, image-based scientific analysis. That is then compared against interviews and media reports and volunteer information, etc,” Bjorno stated. order now During the Kyrgyzstan conflict, a couple of years ago, UNOSAT received reports of ethnic violence, Bjorgo recalls. “We used very coarse satellite imagery to see whether there was fire detection, because there were reports of houses being burned. Indeed, we did see fire signals in an urban environment. Then we were able to program much more detailed satellite images and do damage assessment and ongoing monitoring of this situation.” See Figures 1-2. This image of Kyrgyzstan was the high-res image used by UNOSAT to create the annotated image on the right, courtesy of DigitalGlobe. A related article on the Satellite Sentinel Project appeared in the Spring 2011 issue of Imaging Notes. 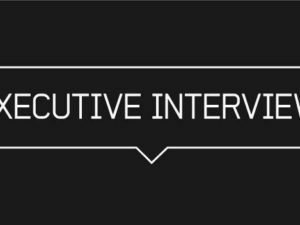 “Some of our ongoing customers give us information they have to help drive our collections,” says Andy Dinville, DigitalGlobe’s Senior Manager for Intelligence Solutions. 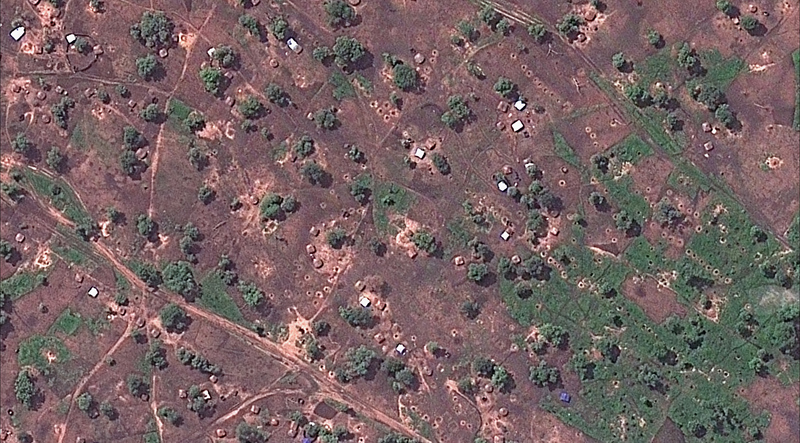 “For instance, we’ve worked with the Satellite Sentinel Project in Sudan to try to understand from their sources some of the things that are going on to help point the camera on the satellite at some of the places where there are express concerns of human rights violations occurring or attacks or harassment activities going on.” See Figures 3-4.
of the bottom image, taken Sept. 8, 2013. Before image was taken June 12, 2013. Both are courtesy of DigitalGlobe. DigitalGlobe also monitors events around the world, such as typhoons, and tries to anticipate where they will have the greatest impact, so as to maximize its chances of collecting valuable imagery. DigitalGlobe has a growing analytical capability that was part of the legacy GeoEye organization, and they continue to invest in that business. DigitalGlobe Intelligence Solutions combines Earth imagery, deep analytic expertise, and innovative technology to deliver integrated intelligence solutions. Analysts currently support security missions embedded with combatant commands, special operations and other U.S. government mission partners as well as a growing list of NGOs like the Enough Project and the Satellite Sentinel Project. The resolution of half a meter or better of open-source commercial imagery is sufficient to recognize the presence of people on the ground—for example, refugees, protesters, or military personnel—as well as vehicle types. “For instance, across Africa, we can recognize U.N. vehicles bringing relief supplies to an internally displaced persons (IDP) camp,” says Dinville. “The combined analytic capability of unclassified satellite imagery at its current resolution and information available through open-source means are more than adequate to expose ‘Left of Boom’ activities,” says Stokes, using a military term for the precursors to an attack. See Figure 5. 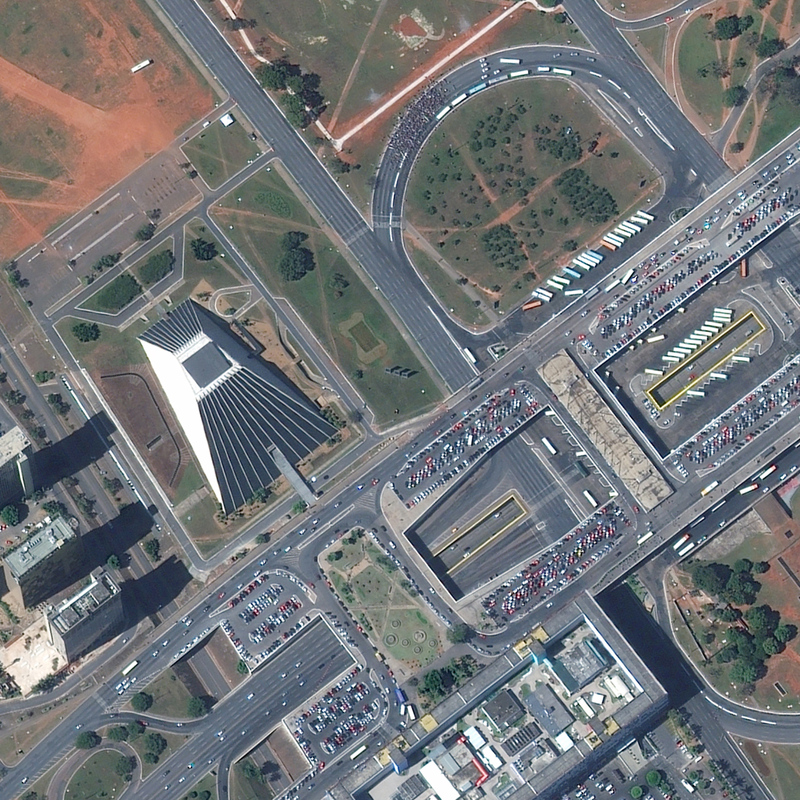 This image taken June 15, 2013, by WorldView-2 captures a crowd protesting the Brazilian government’s decision to raise bus fares. 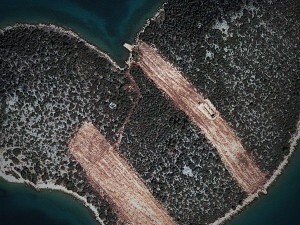 Courtesy of DigitalGlobe. UNOSAT uses the full range of open source imagery, from both government satellites and commercial providers. This can be a challenge, says Bjorgo, because of the number of data formats and new developments. 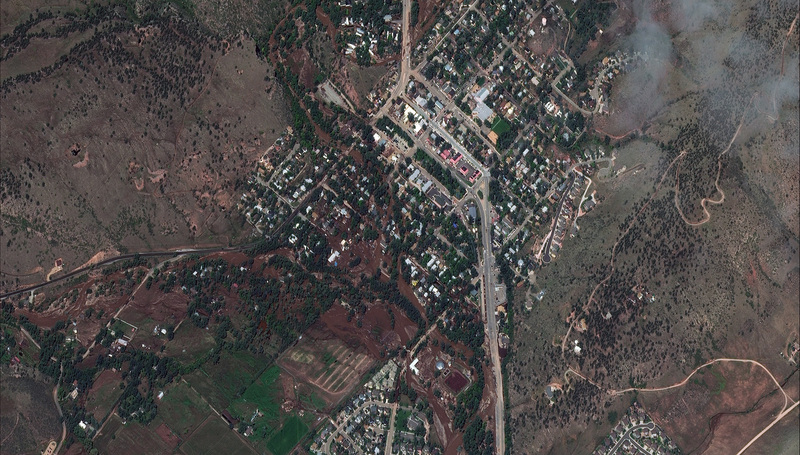 From commercial satellite companies, it acquires mostly very high resolution imagery. Increasingly, UNOSAT buys imagery, due both to its improved finances and to the fact that the commercial companies have dropped their prices. HAVE SATELLITES CHANGED BEHAVIOR ON THE GROUND? Ultimately, however, do governments and rebels behave differently because they are aware of being “watched” by satellites? It may be too soon to tell. When Iraq invaded Kuwait in 1990, leading to the first Gulf War, there were not enough commercial satellites to capture the event and the current constellations of Earth observation satellites still barely existed when the United States invaded Iraq in 2003. “Satellites have not yet been used to document a cross-border intervention,” Brown points out. According to Dinville, however, DigitalGlobe’s work in Sudan and, more recently, in Egypt provides some examples of behavioral changes brought about by satellites. “Both Sudan and South Sudan are being watched,” he says. “The satellite imagery that we’ve used has at least helped illustrate and illuminate actions by both parties to help make them understand that they can’t just do whatever they want and have no consequence. As we collected imagery over Tahrir Square, we saw more people joining the protests and the military backing off a little bit because they knew that they were being watched. The more we can monitor these events and get the information out rapidly, collaborating with reliable information sources to document these events, the more it will have an impact.” See Figure 6. 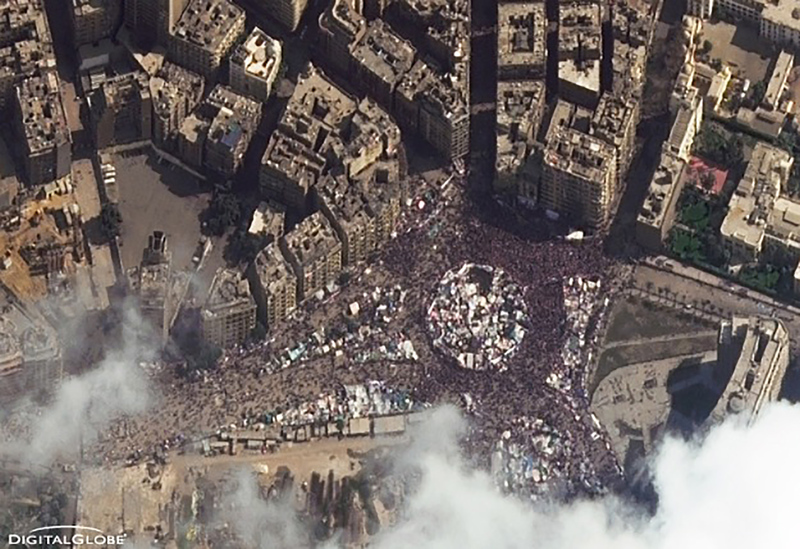 This image shows Cairo’s Tahrir Square on February 11, 2011, the day Hosni Mubarak gave up the Egyptian presidency, when an estimated 300,000 protesters gathered in downtown Cairo, Egypt. Courtesy of DigitalGlobe. Brown is skeptical. The real question, he says, is leveraging all that data and turning it into deterrence for actors who are violating international norms and using it as evidence to prosecute war crimes and crimes against humanity. The effort to document what the Syrian government has done is unprecedented, he points out, yet despite images of carnage, destruction, and mass graves from both satellites and sources on the ground, the Syrian government remains committed to maintaining control. UNOSAT recently signed an agreement with the International Criminal Court that enables the latter to rely on UNOSAT expert analysis for the cases that are brought to it. Bjorgo expects this collaboration to become “almost routine for any upcoming war-crime cases, as long as imagery can bring something to the table.” See box to right. 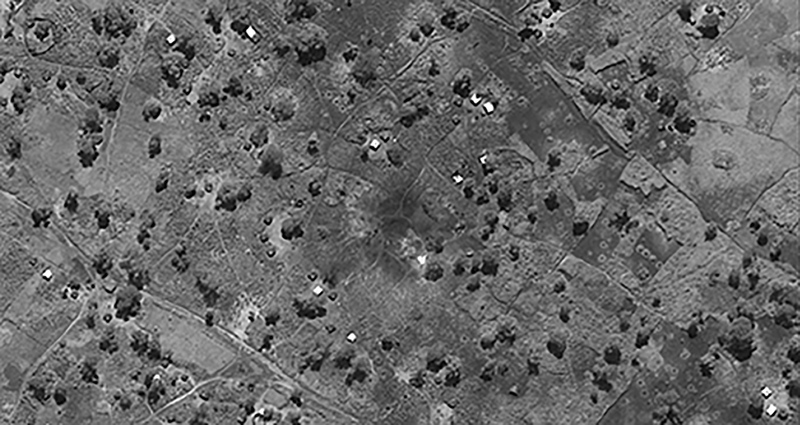 While the use of satellite imagery began nearly sixty years ago, its use as a tool to help prevent, document, and prosecute war crimes and crimes against humanity is still in its infancy. Its effectiveness for this purpose will depend on the collaboration of private satellite companies, governments, and NGOs in building a system that international tribunals will accept as reliable and impartial. In the war in Afghanistan, more than 60 percent of U.S. casualties have been due to improvised explosive devices (IEDs). U.S. efforts to counter IEDs have focused overwhelmingly on the explosion—for example, by spending billions of dollars to develop and deploy electronic jammers—and on mitigating its effects. However, as early as 2003, Army officers spoke of the need to disrupt insurgent cells before bombs are built and planted. In military parlance, this was referred to as shifting the focus from “right of boom” to “left of boom”—that is, from actions and activities following the explosion to those preceding it on a timeline. The latter expression was popularized by a series of articles by Washington Post staff writer Rick Atkinson, titled “Left of Boom: The Struggle to Defeat Roadside Bombs,” which appeared in the paper in the fall of 2007 and later in a book by the same title. The expression “Left of Boom” has since been used more broadly to refer to activities or programs aimed at preventing crises or catastrophic events. In the context of this article, it refers to the use of remote sensing to obtain early warning of an impending military attack or mass killing with the aim of helping to prevent it. Finally, while satellite imagery has been submitted to and considered as evidence by the International Criminal Court (ICC), it has not been formally admitted as evidence by the court. 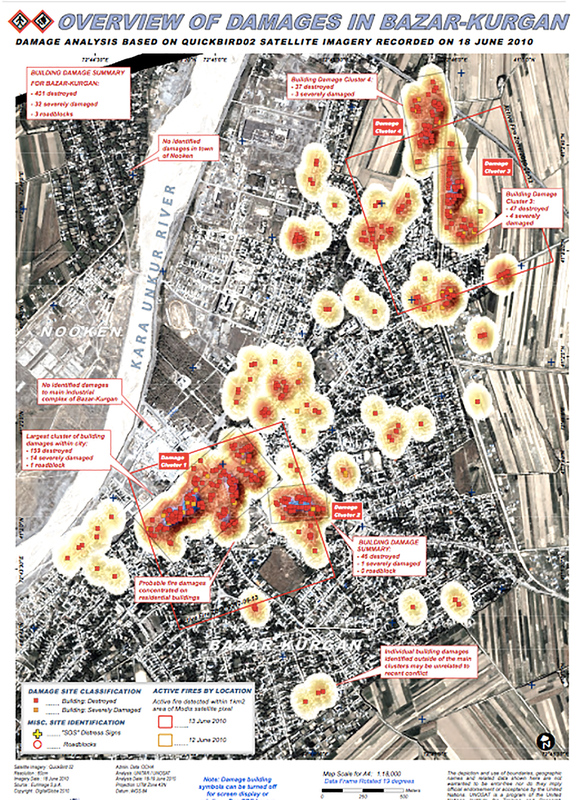 A first case in which the ICC accepted this kind of evidence would establish a crucial legal precedent— making it more likely that satellite imagery would be admitted as evidence in the future, encouraging its use as an investigative tool by the court’s chief prosecutor, and encouraging the formation of other independent data analysis projects.